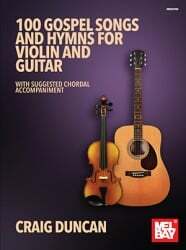 100 Gospel Songs and Hymns for Violin and Guitar is a comprehensive collection of all-time favorite gospel hymns arranged for violin solo with suggested written chordal accompaniment. Fingerstyle guitar and strum styles are indicated on each solo. Other chordal instrumentalists can also use the written material and accompany the violin soloist. These treasured songs are ideal for any worship service or gathering.